God says he is one God. 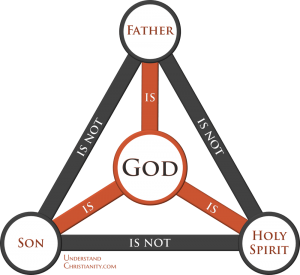 Christians refer to God as the Trinity, the three-in-one God. The first thing you need to know about this teaching is that you’re not going to fully understand it. No human being can because it goes against human logic. The Bible teaches us that God is one. 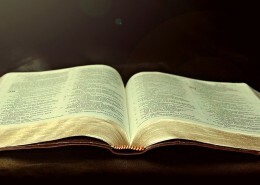 The Bible also teaches us the Father is God, the Son is God, and the Holy Spirit is God. But he is not three Gods—he’s one God. Christians refer to this concept as one God being three persons because “persons” is the best word to accurately reflect what the Bible is telling us. If you would’ve told your Math teacher growing up that 3 = 1, they would’ve looked at you like you were crazy. And yet, that’s exactly what God teaches us about himself in his Word. God is one God. God is three persons. Because of this, Christians refer to God as triune, or as the Trinity, the idea of three (tri-) in one (-une). The words “triune” and “trinity” are not found in the Bible, but over time the Christian church developed these words to describe God. They developed them because saying “triune” or “trinity” is a lot easier than saying “three persons in one God” every time you want to mention the teaching. And although the words “triune” and “trinity” aren’t found in the Bible, the teaching certainly is. The most obvious way we see that God is triune is when the Bible refers to each person of the Trinity as “God.” The Bible calls the Father “God.” “Grace and peace to you from God our Father and from the Lord Jesus Christ” (Romans 1:7). “How great is the love the Father has lavished on us, that we should be called children of God!” (1 John 3:1). Jesus even tells his disciples, “I am returning to my Father and your Father, to my God and your God” (John 20:17). The Father is obviously called God. The Bible elsewhere refers to Jesus as “God,” both in the Old Testament and the New Testament. In the Old Testament, Isaiah says the Savior will be called “Immanuel” (Isaiah 7:14; Matthew 1:22-23), which means “God with us.” He also says the coming Savior will be called “Wonderful Counselor, Mighty God, Everlasting Father, Prince of Peace” (Isaiah 9:6). 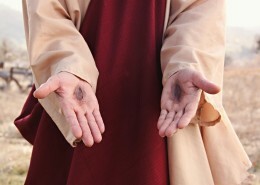 In the New Testament, one of Jesus’ disciples calls him “my Lord and my God!” (John 20:28). The apostle Paul calls Jesus “our great God and Savior” (Titus 2:13), says that he is “in very nature God” (Philippians 2:6), and that “in Christ all the fullness of the Deity lives in bodily form” (Colossians 2:9). The apostle John calls Jesus “the Word” and says, “In the beginning was the Word, and the Word was with God, and the Word was God” (John 1:1). In the Bible, the Father and the Son are both clearly referred to as “God.” So what about the Holy Spirit? The Bible also calls the Holy Spirit “God,” both in the Old Testament and the New Testament. Throughout the Old Testament, God refers to the Holy Spirit as “my Spirit” or “the Spirit of God” (Genesis 6:3; Numbers 24:2; e.g.). Israel’s great King David begins his last words with: “The Spirit of the LORD spoke through me; his word was on my tongue. The God of Israel spoke, the Rock of Israel said to me…” (2 Samuel 23:2-3). (Whenever you see “LORD” in all capital letters in the Old Testament it is referencing God’s name for himself, “I AM WHO I AM.”) In the New Testament, a group of believers proclaim to God, “You spoke by the Holy Spirit” (Acts 4:25). The apostle Peter tells a man that he has “lied to the Holy Spirit,” and then four sentences later tells the man, “You have not lied to men but to God” (Acts 5:3-4). The Father, the Son, and the Holy Spirit are all separately referred to as “God” in the Bible, so that’s the most obvious way we see the teaching of the Trinity. But there are other ways we see this teaching as well. One way we see it is that all three of them have attributes only God can have. One of those attributes is omniscience, the knowing of all things. God alone knows all things (1 Kings 8:39; Psalm 139), and we read in the Bible all three persons of the Trinity have this ability (1 John 3:20; John 21:17; 1 Corinthians 2:10-11). Another attribute is that God is eternal, he’s outside the realm of time (Psalm 90:2). The Father and Son are eternal (John 1:2; 17:5; Micah 5:2) and the Holy Spirit is eternal (Hebrews 9:14). 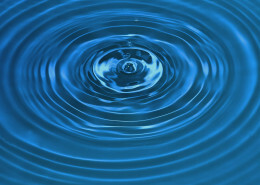 God has omnipresence, that is, God is present everywhere (1 Kings 8:27; Jeremiah 23:24). The Father (Ephesians 4:6), the Son (Matthew 18:20, 28:20; Ephesians 4:10), and the Holy Spirit (Psalm 139:7-10) are present everywhere. The Bible says only God deserves divine honor and praise (Isaiah 42:8). Divine means that something is from or associated with God. The Father, Son, and Holy Spirit are all given divine honor and praise (Isaiah 6:3; John 5:23; 1 Corinthians 3:16, 6:19-20). All three persons of the Trinity are also given credit for doing things only God could have done. Only God created the world and everything in it (Genesis 1; Psalm 33:6). The Bible also says that each person of the Trinity created the world: The Father (Isaiah 64:8), the Son (John 1:3; Colossians 1:16), and the Holy Spirit (Genesis 1:2; Job 33:4). All three persons give spiritual life (John 5:21; 2 Corinthians 3:6). All three persons dwell in us through faith (John 14:20, 17:26; 1 Corinthians 3:16). The Father, the Son, and the Holy Spirit all do the work of God. We also see shades of the Trinity throughout the Bible, things that aren’t proofs in and of themselves, but they still show evidence of God being triune. For instance, there are times when God refers to himself as “us” (Genesis 1:26, 3:22, 11:7). 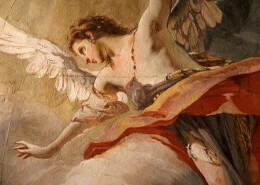 In the book of Isaiah, angels are seen praising God in a way that reflects the three persons: “Holy, holy, holy is the LORD Almighty; the whole earth is full of his glory.” A few verses later God asks, “Whom shall I send? And who will go for us?” (Isaiah 6:3, 8). Paul writes in one letter, “May the grace of the Lord Jesus Christ, and the love of God, and the fellowship of the Holy Spirit be with you all” (2 Corinthians 13:14). In another letter he writes, “For through [Christ] we both have access to the Father by one Spirit” (Ephesians 2:18). The shadows of the Trinity can be seen throughout the Bible. Does all of this mean that one God is simply playing three different roles, like an actor wearing three different masks? No, because the Bible also describes the three persons doing certain things within the Trinity that show they are independent of each other. The Father sent the Son (John 5:36-40). The Son is ‘begotten’ of the Father from before the world began (Psalm 2:6-7; John 1:14, 17:5). The Father sends out the Holy Spirit (John 14:16, 26). The Son also sends out the Holy Spirit (John 16:7). The Holy Spirit goes out from the Father (John 15:26). Throughout the Bible, we can see a distinction being made between all three persons. While the Word of God teaches us there are three distinct persons, it also teaches us altogether there is still just one God. In the Old Testament it’s written, “Acknowledge and take to heart this day that the Lord is God in heaven above and on the earth below. There is no other” (Deuteronomy 4:39). “Hear, O Israel: The LORD our God, the LORD is one” (Deuteronomy 6:4). “I am the first and I am the last; apart from me there is no God” (Isaiah 44:6). And in the New Testament it says, “There is only one God” (Romans 3:30). “We know that an idol is nothing at all in the world and that there is no God but one” (1 Corinthians 8:4). “Now to the King eternal, immortal, invisible, the only God, be honor and glory for ever and ever” (1 Timothy 1:17). The Bible teaches us there is one God. The Bible also teaches us the one God is Father, Son, and Holy Spirit. All three persons are called ‘God.’ All three persons have the attributes of God. All three persons do the work of God. And yet, though they are three, they are one God. Our human logic may not be able to fully understand how it works, but the teaching is certainly there. There’s no Math book on earth that says “3=1,” but that’s what God has decided to reveal about himself in his Word: He is triune.